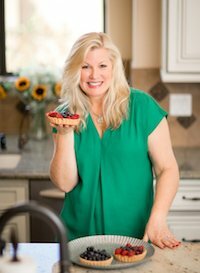 If you followed RecipeGirl on the blog or Twitter or Facebook this past summer, then you know that my family went on an 8-week road trip (driving) across the USA and back. Here’s a route of our entire journey, but on this post I’ll be sharing food and photographs traveling from Boston to San Diego. If you’re interesting in reading from the beginning, I shared the first part of my journey HERE (San Diego to Boston) . We did a lot of fun things on our trip, but I’m primarily sharing the food highlights with you. From Boston we headed through RI and CT to Bedford, NY where we stayed with friends. 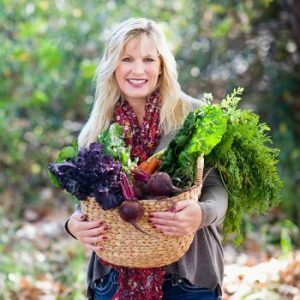 Bedford is a beautiful place- Martha Stewart lives there! I scoured a local market for imported cheeses and was hoping maybe I’d run into her- no such luck. Our friends kids go to school with Richard Gere’s kids- but no luck running into him either 🙁 We did see some deer though, and that was cool. 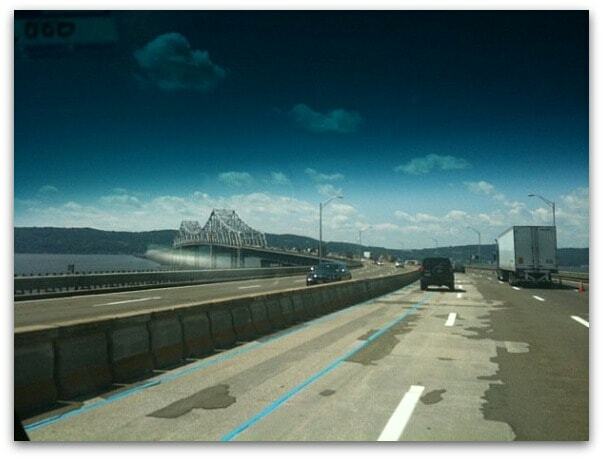 Some of you may recognize this as the Tappan Zee Bridge… which we crossed on our way to NJ (to stay with more friends). Jersey gets a bad rap sometimes with those Housewives and Shore Girls. It’s really a very pretty state though. See? 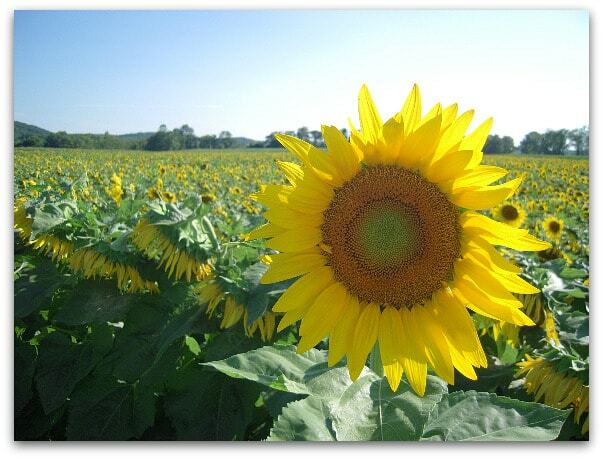 I spotted this Sunflower field on our way to Mountain Creek Waterpark in Vernon, NJ. The waterpark is a ski-resort transformed into waterpark in the summer- LOTS of fun, but didn’t care for the large amount of day campers and the be-bop hit music blasting all day long. 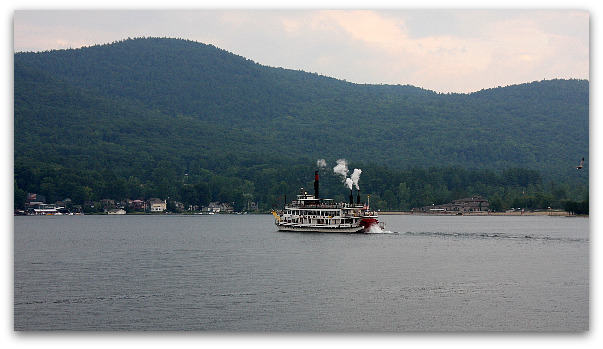 Our Jersey friends convinced us to head to Lake George, NY next. The best way to describe it is like a Lake Tahoe of the East… but a much more affordable. We rode the Minne Ha Ha (boat). Fun, short ride- good way to see a chunk of the lake. 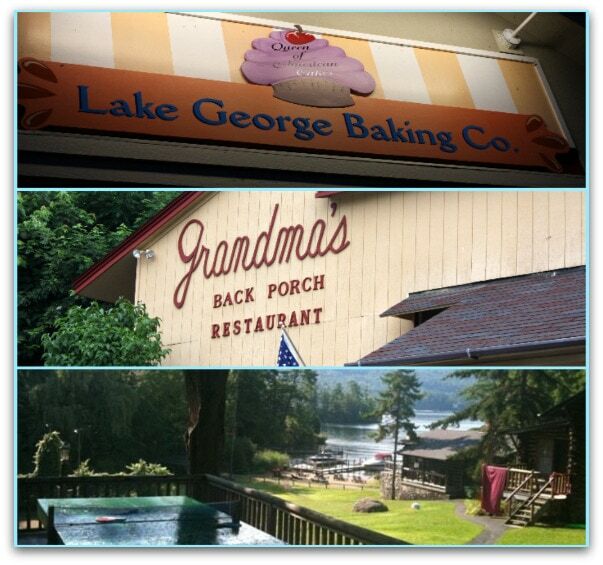 Lake George isn’t a real foodie destination, but we did find a few treasures: Lake George Baking Company (had amazing chocolate chip cannoli and Italian cookies), Grandma’s Back Porch Restaurant (nice, down-home atmosphere- we had breakfast there and it was good, but their apple pancakes needed more apples), and the best place of all was a recommendation from our NJ friends- breakfast at Alpine Village Lodge on the SW side of the lake. It’s nothing fancy, but you have a beautiful view (bottom pic above), and two people can eat a good breakfast for less than $10. From Lake George, we took the most gorgeous drive through upstate NY toward Canada. Lots of small towns, tons of trees and streams. 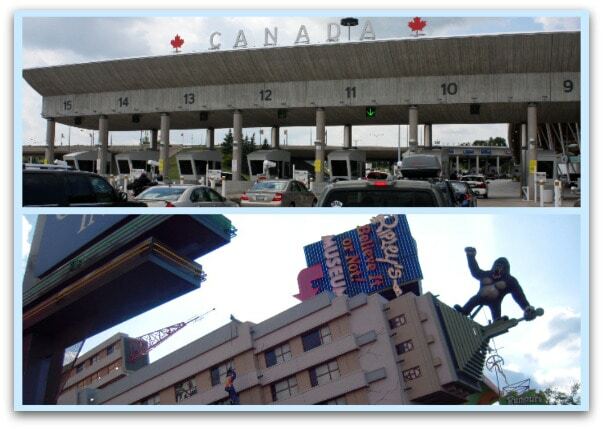 Canada was our next stop… to see Niagara Falls, of course. Everyone told us to head to the Canadian side to experience the best view of the Falls, so we did. And we were GLAD we did! The town of Niagara Falls itself is beyond tacky with all of the commercialism, haunted houses, and numerous Ripley’s Believe it or not Wax Museums, but the Falls are beautiful. I’m sad to say that we didn’t have any good food in the town of Niagara Falls. Everything was so commercialized and there were restaurant chains all over the place. 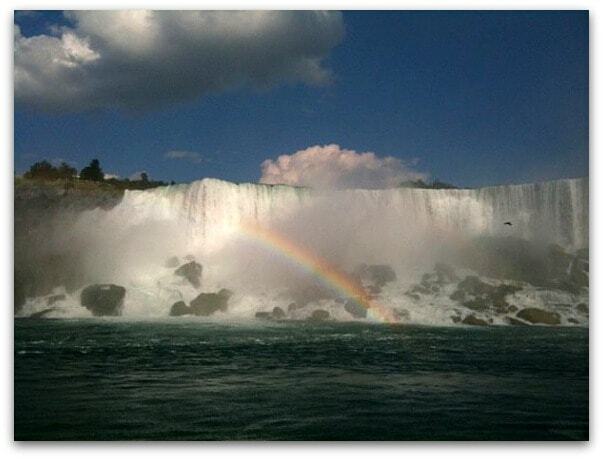 One night in Niagara is plenty- see the Falls and move along. From Niagara, we drove to Chicago. We stopped at a darling little, privately owned sandwich shop outside of Cleveland in Westlake, OH– Picc-A-Deli Cafe. We just happened upon it- and it was so refreshing to find something other than a Subway. Terrific selection of sandwiches and salads if you’re ever in the area. We spent a whole week in Chicago, mostly visiting museums with our son. If you’re one who likes to visit museums, I recommend purchasing the Chicago City Pass– you’ll get priority entry (great if it’s a busy time) and it’s cheaper if you plan to visit three or more places anyways. We especially loved the Museum of Science and Industry. And here we are at the top of Sear’s (Willis) Tower. Lincoln Park Zoo is FREE, though it can’t compare much to our San Diego Zoo! Cafe Ba Ba Reeba (Tapas Bar): Baked Goat Cheese in Tomato Sauce, Tres Leches Cake… all so good! We left Chicago one afternoon quite late and decided to drive through the night all the way to our next destination: Mt Rushmore. About two hours after we left Chicago, we realized that we left a large duffle bag full of clothes sitting in the parking lot back in Chicago. Oops. It was gone. Someone (hopefully someone who needed it) got a whole bunch of my husband’s casual clothes. Oh well. We stopped at an outlet center along the way and my husband got to go shopping. Luckily we didn’t have anything super valuable in that bag. We discovered Culvers (Home of the Butter Burger) in Wisconsin and decided to give it a try. Curious what “Butter Burgers” were, they explained that the buns are buttered. Ok. $4 Snack Pack Meal Deal included Butter Burgers, Wisconsin Cheese Curds (kind of like deep fried mozzarella) and a drink. The burgers were tasty, but not really anything out of the ordinary. Also got the Custard (ice cream) with various mix-in options for dessert. This was a good junk food stop! My husband powered it out and drove through the night, taking us through the bottom edge of MN. The only memory I have of MN is waking up at about 3:30am to use the bathroom at a gas station. It was HOT and there were bugs flying everywhere. I was happy to wake up to this pretty sunrise in South Dakota. SD is filled with rolling, green fields, cows and buffalo. …a darling little Western-style storefront town! 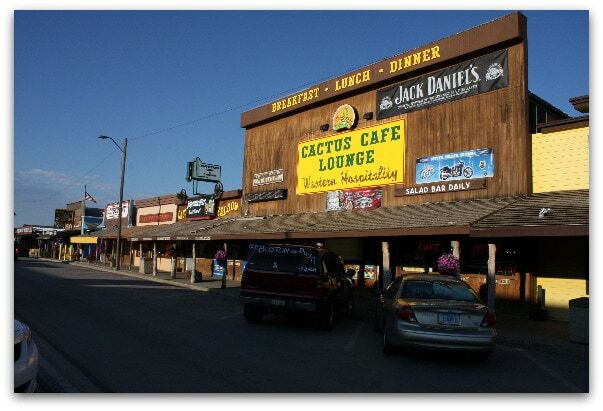 We had breakfast at The Cactus Cafe & Lounge (where I tried buffalo sausage- too tough for my taste). Great breakfast here (fluffy pancakes), but pretty pricey for the middle of nowhere in South Dakota. We spent about an hour in Wall Drug Store, which was very large and seemed to sell everything. Touristy knicknacks and a new cowboy hat in hand, we continued on our journey. Made it to Mt. Rushmore! It was cool… just like the pictures. 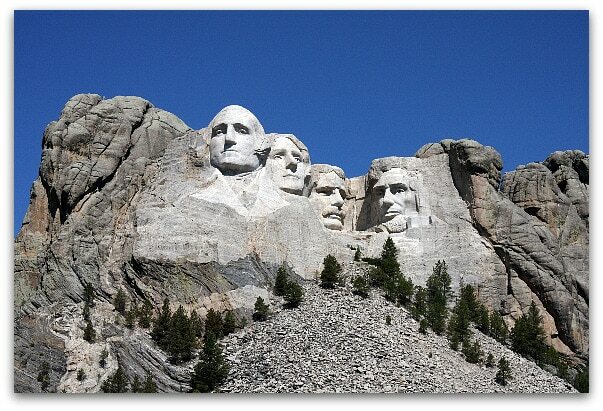 Do you know who all of the Presidents are in the mountain? Listening to chatter among the tourists, people seemed to be able to name 3 of the 4. The one 2nd from the left was the stumper (it’s Thomas Jefferson). Laura from Laura’s Best Recipes told me to be sure and check out Sturgis, where they hold an annual Harley Davidson Rally. 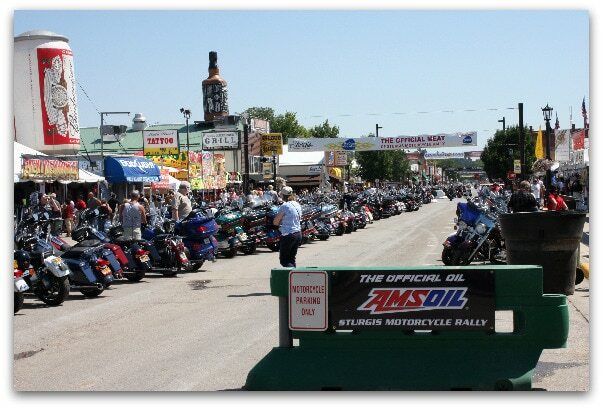 Sturgis draws thousands of folks from all over the US every year. We happened to be in the area right before the rally was about to begin… Harleys (and some very interesting folks) were all over the roads in the area. It was quite a sight to see! After driving 1,000 miles in a little more than 24 hours, we finally stopped for the night in Billings, MT– not much of a picturesque town but we were ready for a good night’s sleep. Our hotel recommended a family-owned restaurant called, “Gusicks“- Restaurant, Bar & Casino. Exhausted from the day, we appreciated the fact that the drinks were cheap. The atmosphere was fun for local people watching. It was a Friday night, which meant folks were out for the evening to have a good time. The appetizer menu listed Finger Steak and Buffalo Fries. We asked… and found out that Buffalo Fries are deep-fried buffalo man parts. 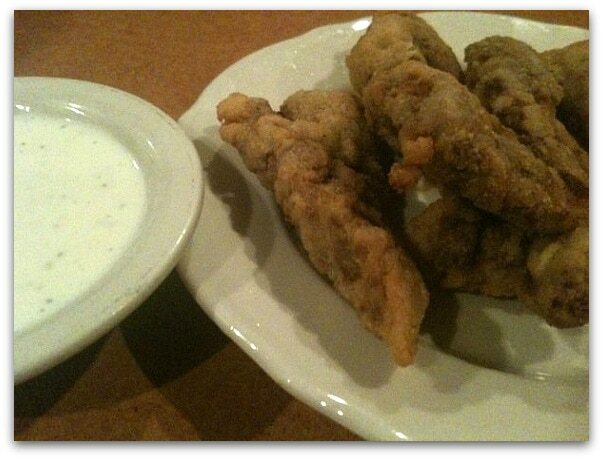 I wish I had tried them (just to say I did), but instead we ordered the Finger Steak- basically batter-fried ground beef with ranch dressing. 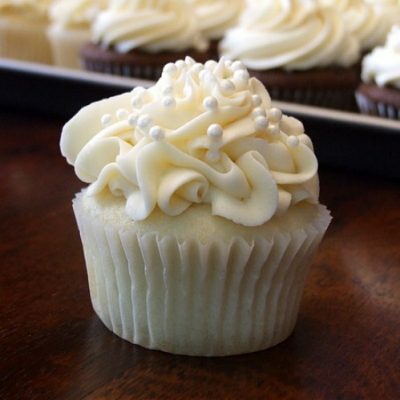 It looks probably as good as it tasted. 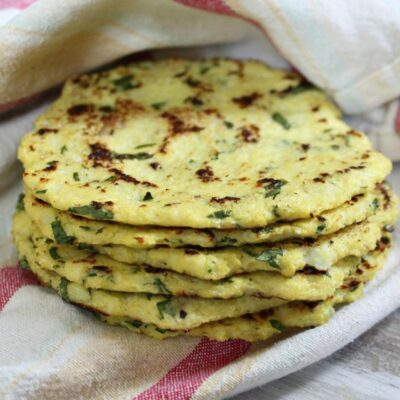 Just goes to show you that you can pretty much deep fry anything and it’s edible, but it’s not necessarily all that good. 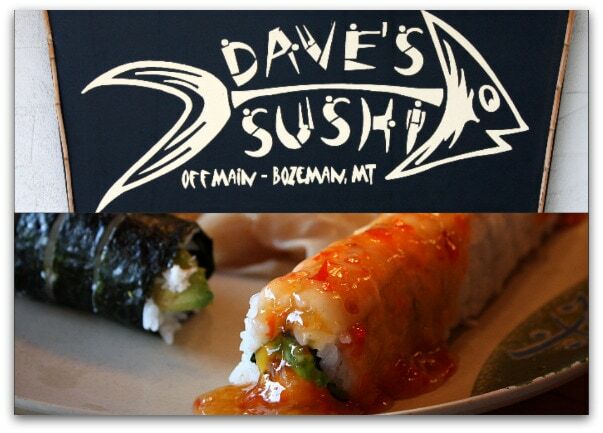 Continuing on our journey through Montana, we stopped in Bozeman to eat at Dave’s Sushi. 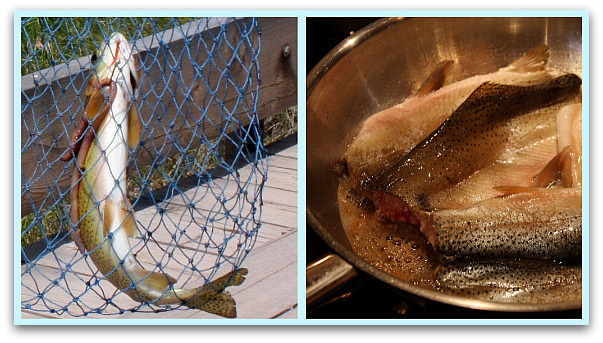 When I think of food in Montana, sushi isn’t the first thing that come to mind… but my nephew- a chef- used to live in Bozeman and told us we had to go there. Dave’s is off Main St., and it’s worth finding. We tried a few different things- my fave was the one pictured above- The Widespread Panic Roll: Spicy Crab, mango, avocado & cucumber w/ shrimp and sweet chili sauce. 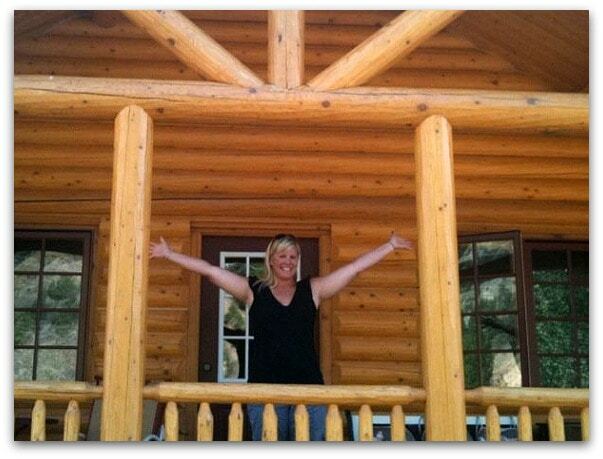 Made it to our rental cabin in Montana! My husband added a caption to this photo on his FB page, “Lori loves it here… but she can’t blog!” It was true, really. We were in such a remote area of Montana (sort of near Anaconda) that there was absolutely no cell phone or internet access. We loved the forced relaxation so we stayed here three days. Our cabin was next to Rock Creek. 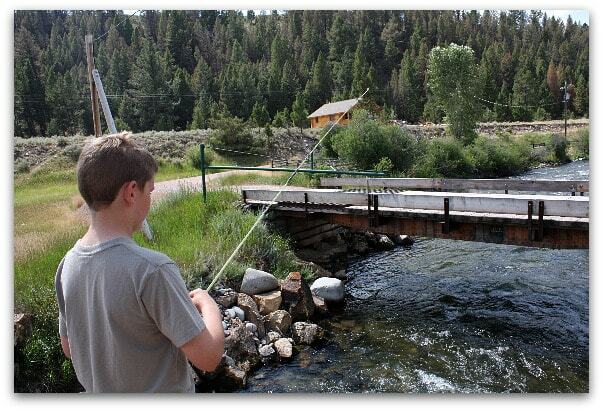 My son spent all day, every day, on this bridge fishing for his first time ever. My nephew is a chef at a resort close to our cabin, so he came by and cooked for us- Antelope Sausage on the left (ok… but kind of chewy & gamey tasting), and Grilled Elk w/ Rich Mushroom Sauce on the right (so, so good). We tried out a farm-to-table restaurant in Hamilton, MT– Sleeping Child Farms. I love the concept of this kind of restaurant but I felt like this one could use a few adjustments to make it more successful. Beautiful setting, but the food was just ok. The salad was very plain and the appetizers were good, but nothing special. My nephew & I both ordered medium rare steak that was delivered to us very well done. They prepared the dish again and brought it to us medium rare a 2nd time, but awkwardly most of our table was finished with their meal by the time we received the corrected dish. They also did not have any sort of kid’s menu, so we ended up having to pay $27 for my son’s chicken (and no break whatsoever on the steak mistake). Also in Hamilton, we hit the Bitter Root Brew Pub for some beer sampling. They had a nice selection microbrews & they were tasty too. This little town is tough to find… Philipsburg, MT. It was about 20 miles from our cabin, so we went into town a few times to grab worms for fishing, lunch at Doe Brother’s Soda Fountain and sweets at The Sweet Palace. Doe Brothers is one of those fabulous old-time diners. We sat at the soda fountain and sampled sliders, Chocolate Sodas and Vanilla Malts. We had such a nice experience that we came back a 2nd time during our stay. The Sweet Palace is a candy-lover’s dream… lots and lots of jars of every kind of candy you can imagine… and chocolates and taffy and fudge. They even had sugar free and gluten free candies labeled as such. We came away with quite of lot of treats to take with us on the rest of our journey. From Montana, we headed to Jackson Hole, Wyoming, an absolutely beautiful drive. 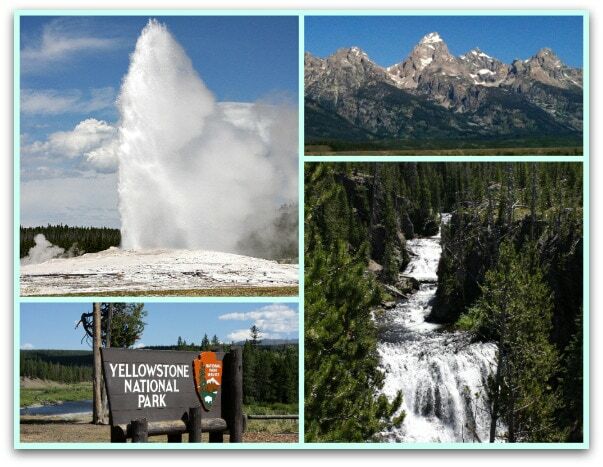 We drove over the Grand Tetons and also through Yellowstone. The Park was awfully crowded with summer tourists, but we loved stopping along the side of the road and seeing various waterfalls and lakes- so pretty. Old Faithful did its thing and spouted up some water (as it does about every 90 minutes), and we all thought it was fairly uneventful. 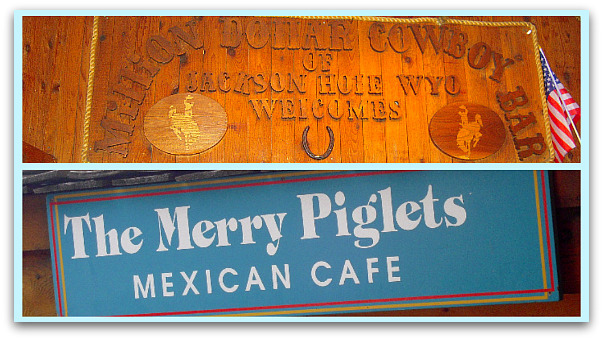 In Jackson Hole, WY, we ate at the Snake River Brewing Company (excellent pizza) and The Merry Piglets Mexican Cafe (just had apps and margaritas here, but it was a fun restaurant w/ good food… I recommend getting a seat next to the open window for good people watching). The Million Dollar Cowboy Bar is worth taking a peek- the bar stools are actual saddles. You must be 21 to enter the bar, so my husband enjoyed while I shopped the cute, little town w/ my son (lots of shops). 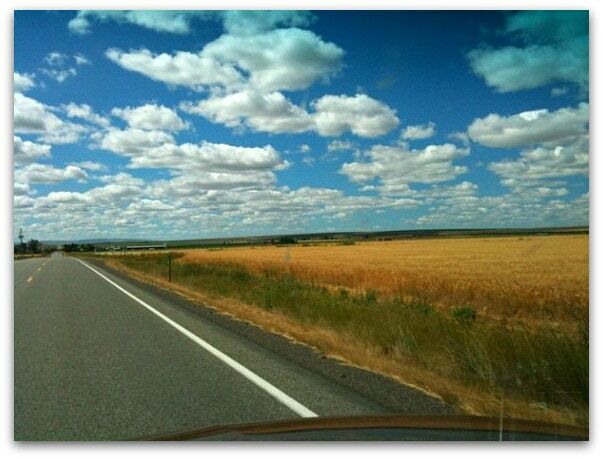 From Wyoming, we began to head toward home… through Idaho (lots more corn fields than I ever imagined they had) and Nevada. Northern Nevada was a boring drive- it all pretty much looked just like this. We stayed a couple of nights in Carson City, NV– stopped in to Garibaldi’s on North Carson St. for cocktails and appetizers (the Marsala Mushrooms over Crostini was delicious, but didn’t care for the calamari at all- it was rubbery and unappetizing). The best find in CC was The Deli Francesco in the Carson Mall- great deli sandwiches and seasoned potato chips, along with homemade potato and pasta salads. From Carson City, we drove the remaining 8 hours or so home to San Diego… finally! *Our GPS & iPhone maps were super helpful. *We made sure to stop at (affordable but comfortable) hotels that had swimming pools. It was nice to relax and get a little exercise and cool off. *We only made reservations in cities where we felt things would be busier… other than that, we just stopped into towns and looked for a hotel. *Things that kept us busy in the car- dvd player, i-Touch, computer w/ wireless card, Sirius Satellite Radio, books, car games. *We stayed with friends and family who were along our driving route when we could. *If a drive through the countryside was prettier than taking the highway, we took the country drive. *We had a rough itinerary in mind, but we kept our options open and remained flexible so it was easy to change plans if we wanted. 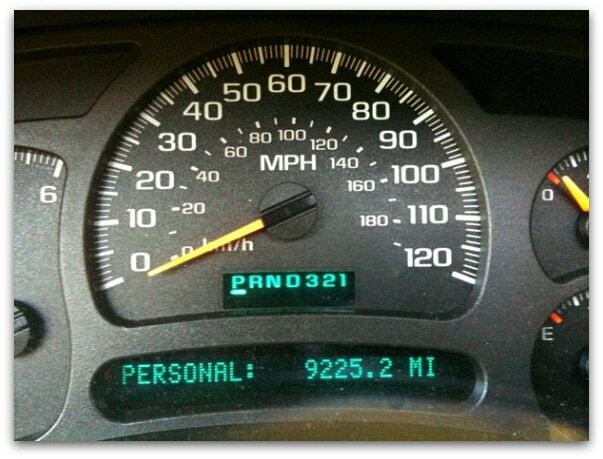 *Combining gas and food stops was helpful w/ speeding things along. *Occasionally, we made PB&J. We had snacks & drinks available in the car. Our family loved every minute of this cross country road trip, and we’d do it again in a second (a different route next time, of course). I think it’s something that everyone should get to experience at one time or another… at least once. My wife and I will be doing this trip but only from Boston to San Diego. Which route would you recommend taking, north or south? I really loved that Northern route. But it’s all fun to see if you haven’t experienced it. Montana is my favorite state, so try to include that one if you can. I live right by the sunflower field! How funny… I saw the pic and I thought “I’ve seen that before”! Glad you enjoyed your drive through NJ. We actually know three of the housewives, and I’m proud to say, I’m a REAL Jersey housewife…not like ANY of them!! So honored you visited and shared the beauty of our state! What a fun recap, trip post, Lori. Makes me want to go all over the country! Just a gorgeous, wonderful trip, Lori! I think so many people are caught up in going to popular destinations, that they forget the road less traveled. I love love love that you guys just sort of meandered across the country, seeing smaller places, but equally exciting and fun as the bigger ones. 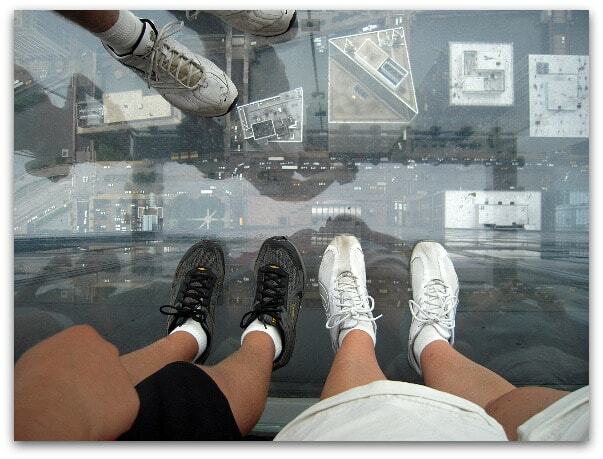 The top of the Sears Tower photo? Makes my stomach flip every time I look at it! What a beautiful adventure. It sounds like you had a fabulous time. 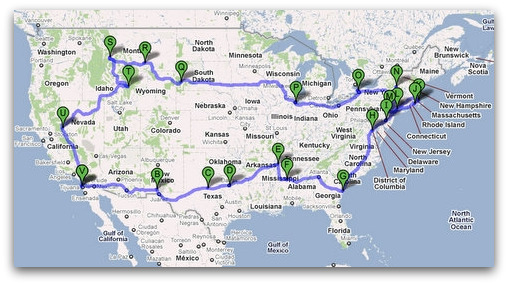 I’d love to do a road trip like this one day. Maybe in a motorhome. 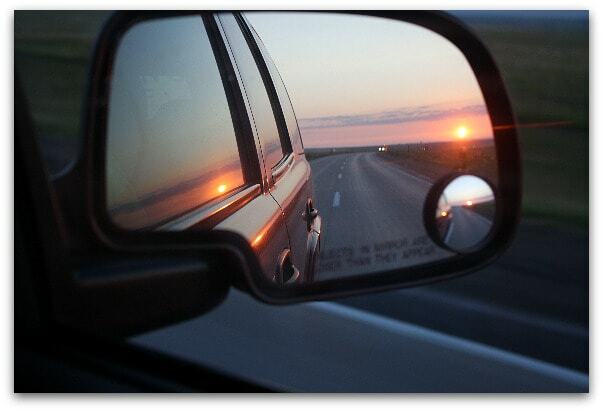 Thanks for sharing your trip home and the great pictures you took along the way. I was right there with you all the way. cool cabin and how scary to stand on that see through thing. Lori, this is such a fabulous, albeit long, trip! I love family road trips: so much to see & you did a great job with your recap. I’m glad you all made it home safe & sound! Looks like the best trip ever!! 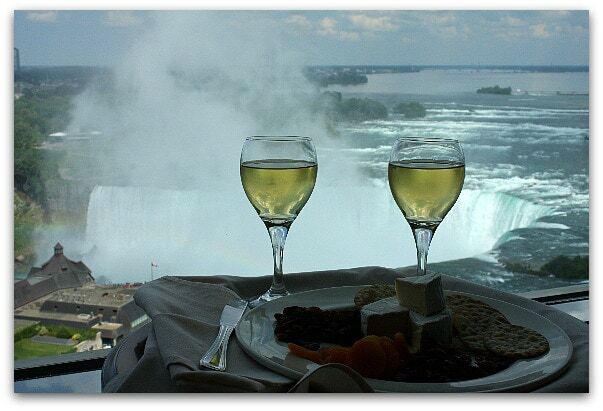 The next time I go to Niagara, I so want to stay in the same hotel room with that view. WOW!